If you’re considering a trip to Seychelles, taking advantage of the crystal clear waters is a must. Not only are the white, sandy beaches the epitome of paradise, but the ocean itself boasts spectacular coral reefs and marine life. And what better way to experience it other than diving or snorkelling in Seychelles? Both of these undersea opportunities deliver a unique aquatic experience. However, it’s important to know the difference between diving and snorkelling to make sure you get the experience you’re looking for. If you’re happy to wade into the water and explore rock pools and shallows, snorkelling in Seychelles is right up your alley. Very little preparation is needed and a licence isn’t needed to do it. While snorkelling, you can reach a depth of around 18 metres. 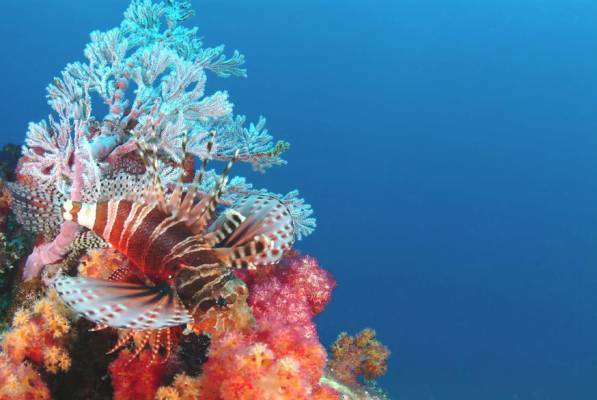 This is deep enough to see many exotic sea dwellers such as butterfly and parrot fish. Best of all, gearing up is simple as you only need a swimsuit, snorkel, fitted mask and some flippers. Snorkelers should remember to be aware of their surroundings above and below the surface and not to touch the coral reefs because their fragile eco-systems are easily damaged. And, most importantly, in the interest of safety you should always take someone with you. Scuba diving in Seychelles is a major tourist attraction for professionals and beginners alike. To enjoy this activity, you’ll need to have training and be certified before getting started. There are several Professional Association of Diving Instructors (PADI) accredited institutes dotted around Mahe, so you can be sure to be prepared and safe while in the water. When you do your entry open waters PADI course you can expect to go up to 18 metres below the surface. Once you’ve gained more experience, you’re eligible to take your training a step further with the advanced course. Training is essential so that you can learn how to deal with the pressure of the water, breathing, and communication underwater. Whether you prefer snorkelling or diving in Seychelles, you can have access to these activities all year round at Eden Island. This luxury marina development offers exquisite properties for sale or for rent and is open to international buyers. And, not only can you live in paradise, but when you buy a unit, you and your family are eligible for Seychelles residency too. Besides exploring the beautiful surroundings, taking advantage of the ocean by diving or snorkelling in Seychelles makes every day an adventure in paradise.